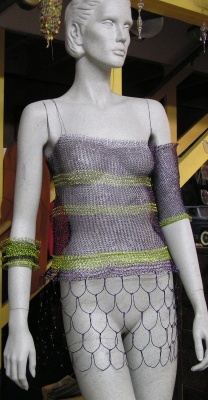 In a previous blog, I had said that I was making a knitted dress out of wire. Here is it. It's about 3/4 done, but needs a few more inches on the skirt, and finish knitting the neckline. I also need to figure out a strap to keep dress on the mannequin. A ruffly knitted bracelet adds decoration to the bare arm. I had to go climbing in the packed barn at the League of NH Craftmen headquarters ( HQ as we League members call it) to get the mannequin out of storage. I'm bringing the entire mannequin with dress on it to Mt. Sunapee Resort in Newbury, NH for the Annual Craftsmen Fair http://www.nhcrafts.org/craftsmens_fair/fair_home.html which is Aug 1-9. The dress is part of the CraftWear Exhibit. I also do the exhibition layout design for Craftwear which is good experience for me. I get to work on how to effectively display beautiful handcrafted clothing, accessories and jewelry in a professional setting. I do like to push myself out of my comfort zone and do exhibit pieces that really challenge me. It's easy to make more beautiful jewelry, but after 20 odd years, I like to think outside the box when making exhibit pieces. I also have a welded steel sculpture that is over 6 feet tall that is for the Sculpture Garden, again at the Annual Craftsmen Fair. I have enough stock for my booth, just focusing on the exhibit pieces that needs to be done by the 21st. I hope you get to come up to the fair. You can find me in Tent 4, Booth 409.